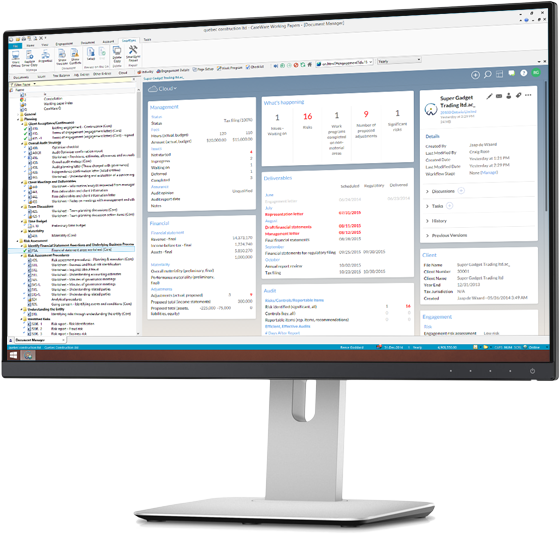 Ideal for firms small and large, CaseWare Online is a powerful solution that can take your Working Papers engagements to a whole new level of efficiency. With CaseWare Online, you can monitor the status of engagements from any web-enabled device. Plus, engagement files are stored in CaseWare Cloud, which means automatic backups and no need for expensive servers. With CaseWare Online, you’ll get full client portal functionality with easy sharing of secure files and messages. What’s more, you can create custom dashboards that give your Clients helpful views into the engagement process. With CaseWare Online, team members can work simultaneously on the same Working Papers file, knowing data is always up-to-date. Offline? No problem. Changes will be automatically synced when you re-connect.